JEC is an annual event hosted in Paris and offering professionals the opportunity to meet with the composites industry. Summary of the 2019 edition? 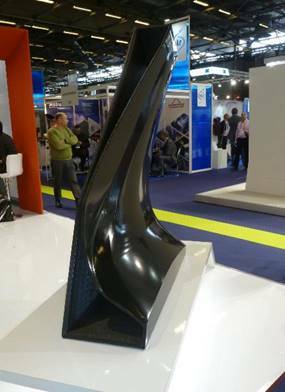 JEC World, a show specialising in composite materials, was held in Paris from the 12th to the 14th of March 2019. This year, it reunited some 1,300 exhibitors from 115 countries, among whom Sirris. What can we conclude on this year’s show? As in many professional shows today, Asian exhibitors were in force, but at JEC, they were scattered across the show, essentially in the form of institutes, R&D organisations and small companies. 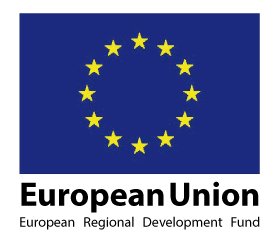 Their presence was not organised via a structured ‘village’, as was the case of Belgian and Dutch exhibitors, or by region, like the French and German participants. Yet, such organisation results in a greater impact on visitors and a more convivial atmosphere. Thermoplastic and hybrid composites are continuing to progress. Every year, these materials are increasingly present, in particular via demonstrators, to the detriment of thermo-hardening composites. 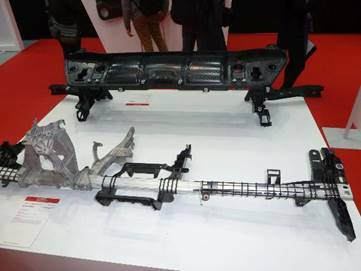 Overmoulding and multimaterials have become key words, as illustrated by parts exhibited by Elringklinger (Germany). Although the Industry 4.0 concept has, as yet, failed to make a lasting mark on the show, the same cannot be said of robotics, the relevance of which is transpiring at all production line levels: reinforcement installation, cutting, trimming, pre-peg positioning, non-destructive control, etc. 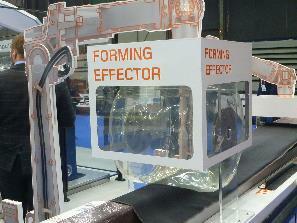 Several machines were on demonstration at the show, whereas others appeared in videos. For example, Airborne (Netherlands) presented a pick and place system comprised of a matrix of individually controllable suction cups, in order to take parts of different shapes, cut out in composite material based on a pattern, and to position them in their correct implementation location. 3D printing is perhaps less present than in previous years in terms of small, low cost machines. In contrast, certain demonstrators in machine tooling manufacturing impressed by the dimensions and the quality of printed parts. Such was the case, for example, of a mould for a helicopter blade, produced using a Thermwood SLAM machine, combining additive and subtractive manufacturing on the same gantry. Ingersoll (US) presented its Masterprint system, which also enables automatic extruder exchange with a 5-axis milling machine for finishing operations. 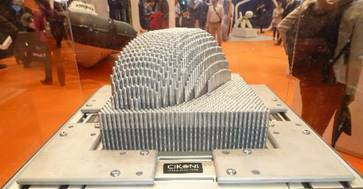 The WHAM (Wide and High Additive Manufacturing) range offers a construction volume of 7 x 3 x 14 metres. Whilst AR/VR techniques are progressively being deployed in all sectors of activity, the composites industry has not yet shown a genuine interest. 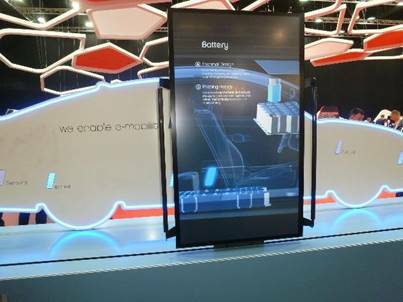 An interesting application developed by Von Roll Automotive (Germany) was nevertheless on demonstration: a description of vehicle components was gradually displayed on a screen, in time with its movement in front of a scale model of a car. Natural fibre components were noticeably less present at the show than over previous years. 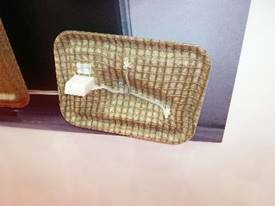 BComp (Switzerland) presented a technology based on a natural fibre reinforcement grid that ensures product rigidity at minimum weight. Inspired by tree leaves, the company has created a veined structure on one side of a thin-walled shell element with, in addition, the possibility to overinject details on the structured face. 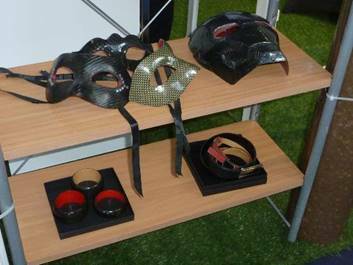 For recycled materials, a number of applications have in turn been imagined: design, jewellery, belt buckles, masks, etc. A + Glide Forming is a continuous and automated technology developed by Applus + (Spain) for the production of complex-curve stringers. These omega- or T-section parts can be found in aircraft fuselage or wings (up to 40 metres). The technology consists in pressing the thermo-hardening pre-preg or dry preform on the core, thanks to a flexible form under pressure - a ‘balloon’. 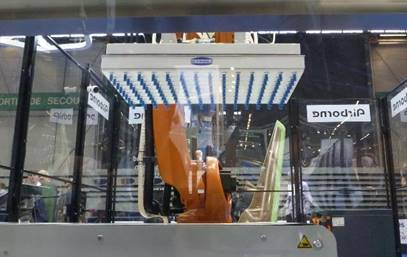 Cokoni (Germany) presented its Dynapixel reconfigurable tooling technology. Thanks to discretisation on the tool surface using pins and screws, tools and prototype parts can rapidly be produced. Without unveiling any spectacular novelties, the 2019 edition of JEC World nevertheless presented some interesting innovations. They highlighted current trends that prove the relevance of Sirris’ strategic positioning via its new Product Development Hub in Seraing and its Composites Application Lab in Heverlee.